I commonly see a criticism of intelligent design that appears to betray a fundamental misunderstanding or even a total ignorance of what is posited by irreducible complexity. I see this straw man fallacy used so often in this context that I am going to presumptuously attempt to canonically identify it as the Skyscraper Fallacy. 3. You think macroevolution is an inherently different process than microevolution. At its core, “macroevolution” is simply the steady accumulation of the small changes we observe in “microevolution.” It seems any sane person must admit that, if small changes can occur, then it is logically consistent that small changes adding up over extremely long periods of time would result in very large changes. On the other hand, the creationist assertion that there is some mysterious, invisible barrier within “kinds” that prevents large-scale changes is as logically consistent as saying you can walk from your front door to the sidewalk, but walking to your friend’s house across town is fundamentally impossible. Now there are many legitimate criticisms of ignorant anti-evolutionary arguments in Tyler Francke’s piece (and elsewhere on his site), but I do not believe this is one of them. It is like saying evolutionary processes build skyscrapers one floor at a time, and viewing the evolutionary critic as believing it is possible to add a couple floors to a small building (microevolution) while believing it is impossible to add hundreds of floors (macroevolution). If the difference between microevolution and macroevolution in the critic’s mind were merely one of magnitude, then it would be legitimate to respond that a large amount of time can easily expand the smaller building and eventually create a skyscraper. To use a more mathematical analogy, it would be like saying evolution is a small multiplier that can turn little numbers into slightly bigger numbers but is incapable of generating gigantic numbers over time. The evolutionary defender claims that the critic is like a mathematician who believes in multiplication but denies the existence of large numbers! How preposterous! But whenever you find yourself flippantly dismissing a position, it is worth examining whether you are responding to the strongest version of the argument, or merely a weaker straw man. Irreducible complexity refers to systems “composed of several well-matched, interacting parts that contribute to the basic function, wherein the removal of any one of the parts causes the system to effectively cease functioning.” The evolutionary critic who posits irreducible complexity is not claiming that all evolutionary processes are like building a skyscraper. He is claiming that many evolutionary processes – perhaps a great deal of them – are more like building an arch. An arch cannot be built layer by tiny layer, or it will fall over. There must be a carefully-designed simultaneous implementation of interlocking pieces for the construction to be successfully completed. You may need a scissors truss to keep the legs steady or even a hydraulic jack to pry them apart for the final piece if thermal expansion complicates your distances. It would be much more difficult to build an arch than a skyscraper through incremental, undirected processes. The difference is not merely one of magnitude; it is a higher degree of difficulty altogether. To return to the mathematical analogy, the critic is not saying that enormous numbers do not exist, and that evolution can’t multiply enough times to get there. The critic is saying enormous numbers do exist – but some of them are primes. But is that really the case? What objections might defenders have to this proposed fallacy? 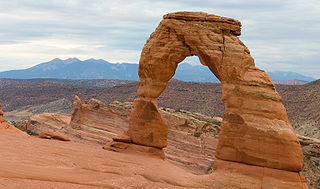 As the above photo from Utah’s Arches Natural Park indicates, it is possible to build an arch through weathering and erosion. The evolutionary defender may posit lost scaffoldings, changes in function, or other mechanisms, as the wiki link does, to potentially explain the development of every interlocking feature known to biology. Perhaps every biological “prime number” is factorable. Perhaps defenders are perfectly aware of the relative complexities of “arches” but simply sincerely believe that evolution is capable of reducing all of them to outcomes that are just as accomplishable as the “skyscrapers,” so that it is not even necessary to acknowledge the difference. I would respond that there is a difference between acknowledging a degree of difficulty that you believe is explainable and ignoring it altogether. I do not claim to be an expert on allegedly irreducibly complex mechanisms or the merits of their proposed reductions. But I am at least not convinced that such explanations have strong enough empirical or even hypothetically modeled evidence to warrant the absolute confidence necessary to implicitly assume such reductions. Furthermore, even if the defender believes the assumption is warranted, I would encourage those who accuse evolutionary critics of sloppy or misinformed postulating to be wary of engaging in such sloppy arguments themselves. When a defender does this, the critic feels his arguments are not being objectively considered but brushed away by the defender’s existing bias. Perhaps you can’t literally walk to “your friend’s house across town” like you walk “to the sidewalk” because there’s a river and a four-lane highway in the way. Even if there are bridges and ferries and shortcuts and crosswalks that allow us to conjecture solutions, I do not believe a mechanism for taking tiny steps allows one to hand-wave away the other degrees of difficulty simply by appealing to greater magnitudes of tiny steps. Thus, when I see complexity-based evolutionary critiques hastily dismissed due to the obvious progression of “small changes” to “large-scale changes,” I am not certain whether or not the dismisser truly understands the argument he is dismissing, and that is why I am calling it the Skyscraper Fallacy.